MIAMI, Florida, April 30, 2008 -- Where the wild things are is often where inquisitive travelers congregate, potentially setting up a love-it-to-death dynamic in the visited environment. A small, visionary travel company, Ecoventura, has announced a new partnership with the environmental heavy hitter, World Wildlife Fund (WWF) to reduce the detrimental effects of growing tourism in the fragile ecosystem of the Galapagos Islands. This new collaboration, called The Galapagos Marine Biodiversity Fund (GMBF), will target environmental education and marine conservation by strengthening the local communities' ability to manage natural resources. "It's the paradise being pushed to the edge concept," says Doris Welsh, Ecoventura's Miami-based Director of Sales and Marketing. "Our partnership mission is to safeguard the Galapagos environment so that we can continue to bring conservation-minded visitors here for generations to come." GMBF funds support the refit, maintenance and deployment of the "Tiburon Martillo," a permanent floating surveillance and patrolling station within the Galapagos Marine Reserve. It's from here that park patrol boats will target, among other things, illegal industrial shark finning and long-line fishing. Funds are also allocated to refurbish and maintain a speed boat that patrols the Bolivar channel between the western Islands of Fernandina and Isabela. The GMBF has also allocated funds to benefit families of local fishermen by supporting a microenterprise for the fisherman's wives to manage. This will provide an alternate means of income and also set an example to create other tourism related businesses and reduce the need to fish in waters already impacted by over-harvesting. A scholarship component for local children of fishermen from San Cristobal Island grants scholarships for two years to study Tourism, Environmental Science or Natural Resource Management at the University of San Francisco campus in the Galapagos. To fund the GMBF, Ecoventura has pledged to raise close to $250,000 over the next three years. Passengers on its 7-day Galapagos cruises are also encouraged to donate to the fund during their trip. During each Ecoventura cruise, a local representative from WWF meets with passengers and gives a brief educational talk followed by questions and answers. Welsh says that while serving the interests of the environment the partnership also empowers local residents through employment, education and related opportunities. Ecoventura is a family-owned company based in Guayaquil, Ecuador, with sales offices in Quito and Miami. 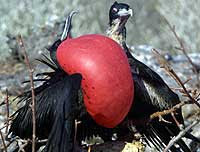 All of its guides are Ecuadorian nationals; 65% are Galapagos residents and 25% are native Galapaguenos. Of 61 crew members, including guides and captains, 37% reside permanently in the Galapagos Islands and of those, 15% are native Galapaguenos. The rest live in different cities in mainland Ecuador. As part of its compensation package, Ecoventura offers medical insurance to its employees and their families as well. The company maintains a warehouse and manager on the Island of San Cristobal and hires only locals to handle its Galapagos-based operation. Approximately 27% of its total food supplies come from local vendors on San Cristobal Island, including all fresh fish and some vegetables. Dairy products and meats are purchased on the Island of Santa Cruz further benefitting the local community. In operation since 1990, the cruise company transports 3,000+ passengers annually aboard a fleet of four expedition vessels that have been purposefully retrofitted to highest possible environmental standards. In recognition of these pacesetting efforts, in 2005 the Rainforest Alliance presented Ecoventura President Santiago Dunn with its prestigious Individual Sustainable Standard-Setter award for making a significant contribution to environmental conservation and sustainability. In 2006, Santiago was awarded the first annual Sustainable Travel Award from the International Galapagos Tour Operators Association (IGTOA). In 2006, Ecoventura also became the first Carbon Neutral operation in the Galapagos (and Ecuador). Carbon emissions from the company's four yachts (and offices including business travel) are reduced, and then offset by contributions to a portfolio of projects through the US-based company NativeEnergy. To receive a copy of Ecoventura's 2008 catalog as well as information on tours to the Galapagos Islands please call toll-free 1.800.644.7972, or e-mail info@galapagosnetwork.com. To access current rates, schedules and itineraries you can log onto http://www.ecoventura.com/.